You’ve booked your tickets, renewed your passport and bought the matching luggage. 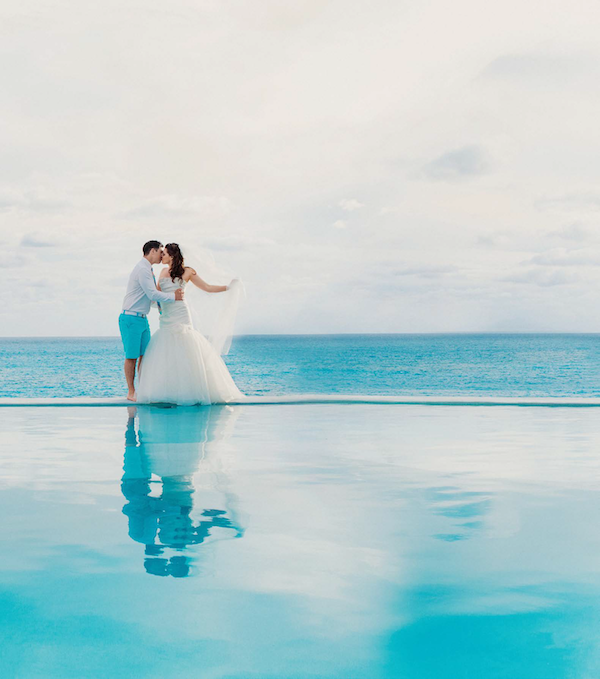 It’s official – you’re having a tropical destination wedding. Now that you’ve got the particulars checked off, it’s time to think fashion. For the majority of your trip, fun in the sun attire will require little to no thought. But for that one day when you won’t be sporting a bikini or surf shorts, what will you wear? Men’s destination wear has evolved greatly from the days of the Hawaiian shirt, puka shell necklace and shorts (can I get an amen?). Many designers are now creating full destination collections for not only the brides, but also the grooms. This means no excuses, guys. Exchanging vows on a beach doesn’t mean you get a hall pass to throw grooming out the window. Moving down the scale, we get to the dress shirt and chinos. The shorts could be as simple as a golf short or a fun nautical short with a pattern that pops. Think blues, yellows, purples and (gasp!) pink. The dress shirt could include rolled up sleeves and a few top buttons undone. A great belt is also the perfect accessory for this look. 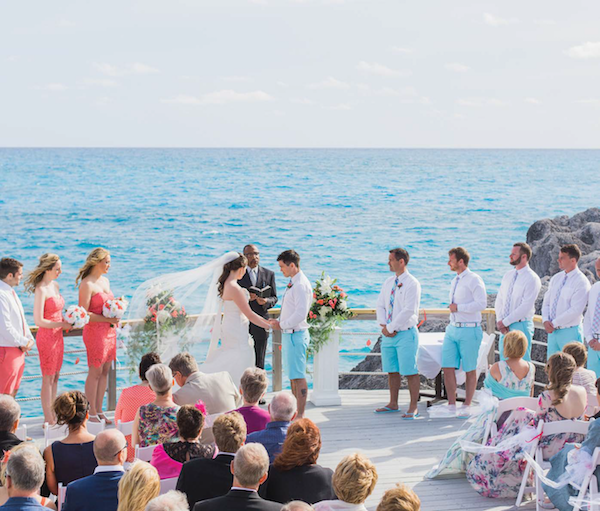 The key is to match your setting, so a bright colour on the top or bottom with a more neutral block of colour will complement that beachy backdrop perfectly. If you are going for paler shades, such as beige, grey, and white, use accessories for that shot of colour. A splashy bow tie, a colourful pocket square, or a floral boutonniere will brighten up a neutral look. The simple strapless or spaghetti strap gowns are no longer the only options for destination wear. This evolvement in bridal includes layers, beading and intricate designs. When choosing your gown, make a beeline to the travel-tested fabrics that will remain intact throughout your journey. Silk tulle is a versatile fabric. It’s lightweight, holds its shape and won’t require a day of steaming once you arrive at your destination. Another jet-setting fabric is rayon crepe – a tough yet elegant material that’s beautiful in bridal. It’s also one of the more affordable fabrics, but still has a silky appearance. Re-embroidered lace is a functional fabric that will fit into several settings – whether an elegant affair or a barefoot beach party. It’s another stress-less material that will travel with little to no wrinkles. 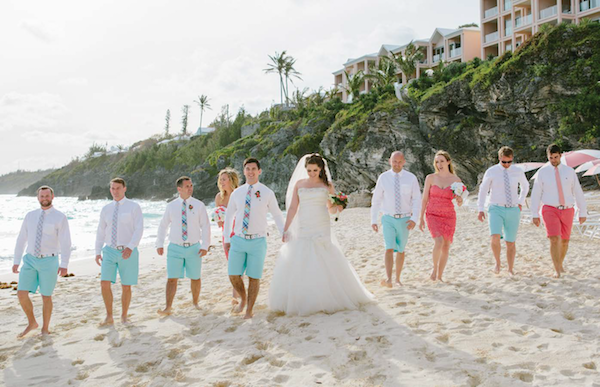 For those brides opting for a cooler destination, wool and knit fabrics are a wonderful option. The dress can go right in the suitcase and come up wrinkle-free and ready to wear. It’s a warm alternative for the winter bride. Bohemian bridal styles are very popular right now, and this is great news for destination brides. Think flowers in your hair, A-line, loose flowing gowns, minimum makeup and free flowing strands. It’s pretty, soft and simple, but still holds the beautiful details of more elaborate gowns, such as beading, embroidery and cut outs. 1 – Transportation.Foradestinationwedding, transporting that dress you love so much is a little more complicated than sticking it in a garment bag and driving it home. Some brides opt to ship it (although for many that’s a scary thought). Others will pray they have a sympathetic flight attendant who is willing to hang the dress in a closet on the plane. There have also been brides who bought an extra seat for their dress. If you do pack your gown for transport, make sure to also bring a travel steamer. An alternative is to hang your gown in the bathroom, run hot water and shut the door. This option allows the wrinkles to fall out naturally. 2 – Terrain. There’s a strong possibility (depending on locale) that the bottom of that gown will touch gravel, sand and even dirt. The less material you have to drag, the better. 3 – Heat. The other strong possibility (especially if you find yourself on the beach) is that it’s going to be a scorcher. There’s a fine line between a healthy “glow” and an intense sweat – don’t flirt with that line. Think light and breathable fabrics that don’t weigh you down. 4 – Tanlines. If you’re wearing a strapless gown, keep that in mind when you’re basking in the sun. Go with a bandeau bikini top to avoid any awkward lines on your day. 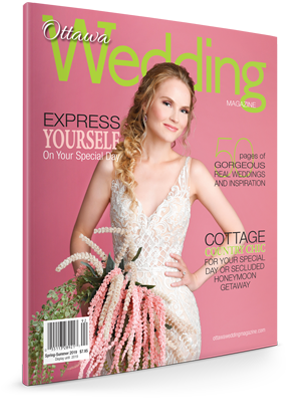 *This story first appeared in the fall/winter 2015 print edition of Ottawa Wedding magazine.